The book is a guide to scholarships and other forms of aid. The coaching really opened our eyes to exactly what we should be doing and when. MDS took the stress out of paying for college. for any student or parent. I wish I would have had this book during high school! Higher education institutions are the first place to look for financial aid, but often their funding opportunities are not transparent for families. Derrius tells you how to find these opportunities. Conveying the activities that you or your student have participated is an extremely important part of telling their unique story and this book explains how to format this effectively. If you have never interviewed for anything before it can be very nerve-wracking. This book tells students how to remain calm and be fully prepared for any interviews that may come their way. Derrius provides students with a number of resources including the very best online solutions to find scholarships as well as some lesser known resources they can use offline. Most funding opportunities will require the perspective of a third-party on the applicant, this book explains how to acquire great recommendations from people in the community. If you have never won a scholarship before it is tough to feel like you are a winner. This book guides students through methods they can use to increase their confidence when applying. Creating a great essay for scholarship applications can be a daunting process. This book helps students address the most common concerns and avoid common pitfalls with writing. Completing numerous applications at the same time becomes difficult to manage when balancing life, this book provides various tips to address the limited time you have to do work. No need to run around wasting your time or energy by doing things that don't work or that you only have to do once – we flag what those items are so that you can apply for more opportunities easier. Get a discount (based on the number of copies) from any other outlet where Winning The Scholarship Race is available for purchase. 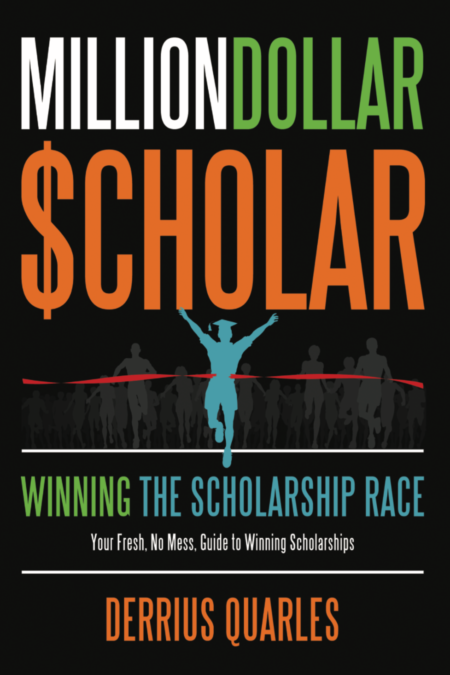 The concepts presented in Winning The Scholarship Race can be easily complemented with our free online resources to maximize impact. With bulk purchases, we can arrange to have your copies pre-signed by Derrius Quarles or arrange a visit to your community. With the purchase of 125 or more books, MDS will provide a complimentary workshop for your school, non-profit or community organization. MDS can work with your organization to provide custom orders and packages that fit the needs of your community or group of students.